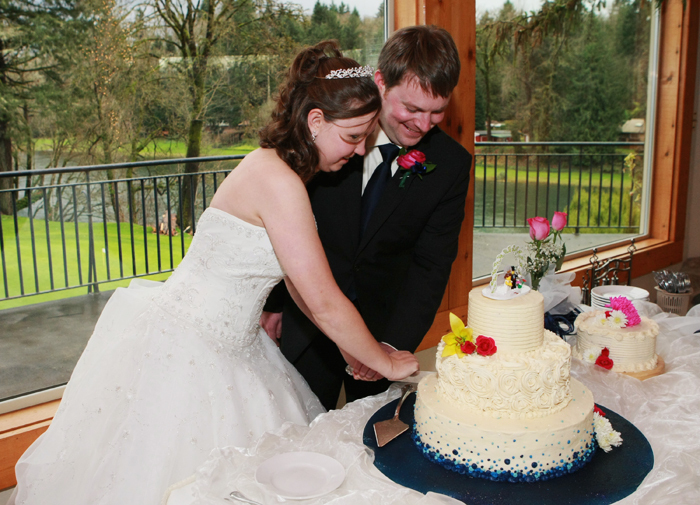 When our friend Laura asked me to make for her wedding, I immediately jumped on board with an enthusiastic “yes!” Making a wedding cake turned out to be a lifelong dream I didn’t even realize I had. But unlike with everyday baking projects, this one came with PRESSURE. 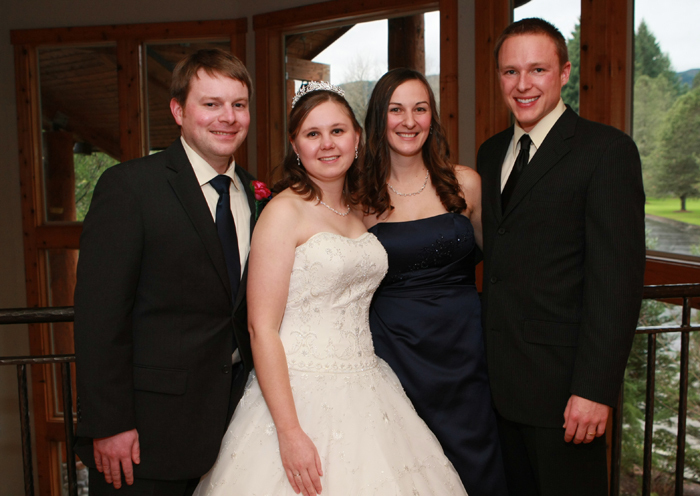 Laura was such a chill bride that the pressure didn’t come from her, but from my own thoughts and expectations. It’s not everyday that I make something to feed over a hundred people. Heck, that hasn’t ever happened any day. I’ll jump to the fun part: decorating the cake. This step was especially awesome because Jess joined in the sugary mayhem (on her first day back in Oregon while visiting from Maryland.) I used a circle of wood, coated with dark blue royal icing with shimmery purple-blue sprinkles to serve as the base. For the first level of cake, I brought the blue up from the base over the ivory butter cream with playful blue dots. We mixed up about six different shades of blue and piped the dots on in varying shades. For the second level, I used a big star tip to pipe out swirly roses. I used a simple comb to get a series of lines on the top level. To finish and tie the layers together, I piped out a line of thick white dots, kind of like pearls, at the base of the second and third levels. 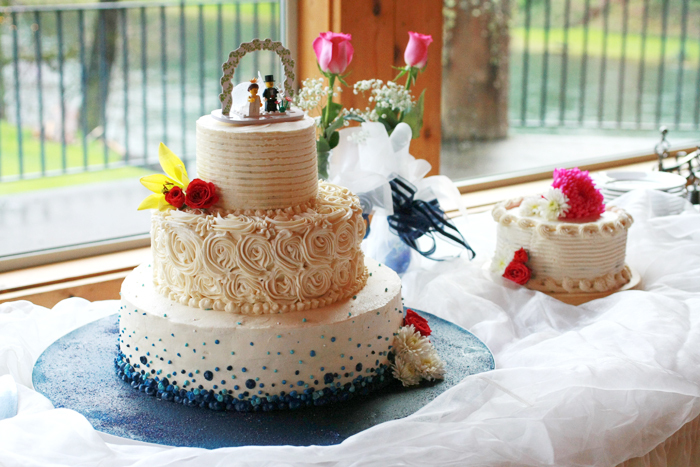 We added a few flowers and the adorably playful cake topper when we got to the venue. Soon, I’ll share some tips and tricks I learned along the way while making this beautiful beast. In the meantime, here are some lovely photos from Laura’s photographer, Michael Hacker. 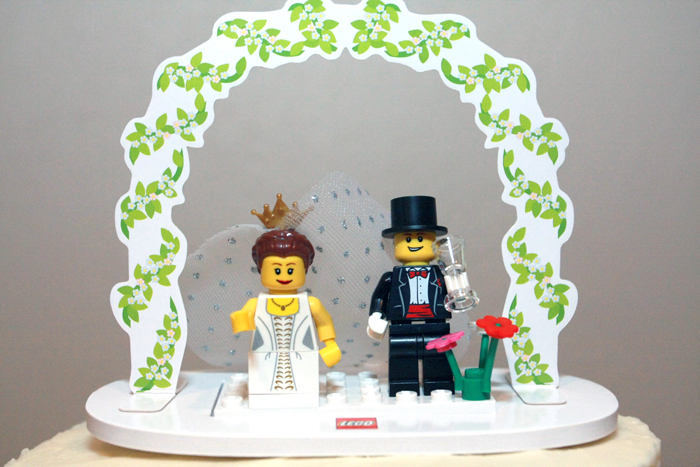 Laura and Matt’s Lego cake topper was adorable! We even had Legos to play with at each dinner table. So much fun. Yay! What a beautiful cake it was, and soooooo delicious! I can still taste the chocolate. 🙂 I miss you guys blogging, but I totally understand having a life too. Love you!